ChristineCreations: It’s TCP Sneaky Peek Week! It’s TCP Sneaky Peek Week! Welcome to Sneaky Peek Week at The Cat’s Pajamas! I’m kicking it all off today with peeks of the new stamps, CutUps dies, and CutAbles for July. We’re all about the delights and whimsy of summer this month! There are three fun new stamp sets, one CutUps die, and two new CutAble files. I’ve got lots of great stuff to show you! 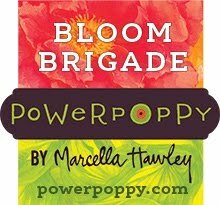 I’m starting it all off with the brand new Big Blooms stamp set. I happen to love hydrangeas and wanted to play with these gorgeous blooms first. 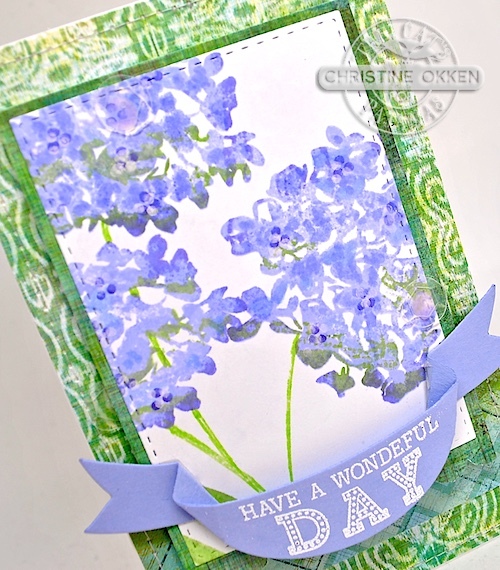 I used my MISTI to stamp the blooms several times in an amethyst and blue blue ink, adding some green to some of the blooms as well. Then stamping some dotted centers with purple ink and white craft ink. The multi-steps really give the flowers more realism. 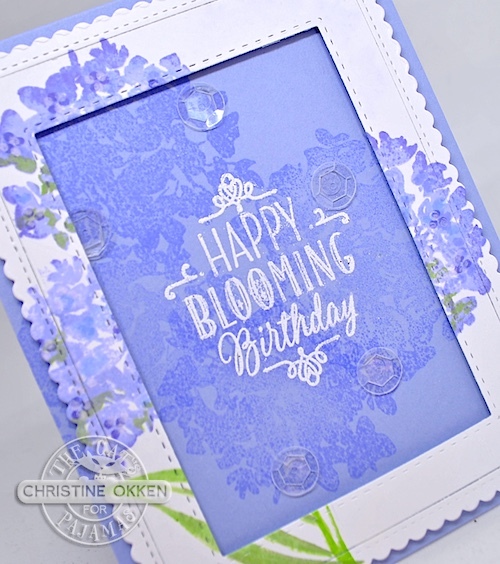 I created a windowed design by die cutting out the middle of the flowers, then used my MISTI to line up the middle so I could restamp the flowers inside the fram in the exact location I needed. You’ll see what I did with the original white inner panel in a minute. I embossed the pretty sentiment inside the design and added some clear sequins for a bit of shine. Now, for that inner panel. No need for a perfectly pretty stamped piece to go to waste. Now I can have two cards instead of one! I used the inner panel to the right for my next card! I created a tall and narrow design here 3 1/2 x 5, pairing it with some pretty designer paper that really shows off the contrasting flowers. I’ve added the lovely new Ribbon Banner CutUps die with a sentiment from another new set this month called Banner Day. It’s stamped in white craft ink and embossed. A few clear sequins adorn this one as well. I really love this fresh colour combination. Next up, I’m creating with my gnomies! These adorable gnomes are from the new set, What’s Up Gnomies. This time I coloured with prismacolor pencils to create a little scene of them sitting on a fence. I’ve used a woodgrain embossing folder on the bottom third of the card, some fun washi tape, as well as some die cut buttons, and enamel dots to accent. They’re such a cute pair! 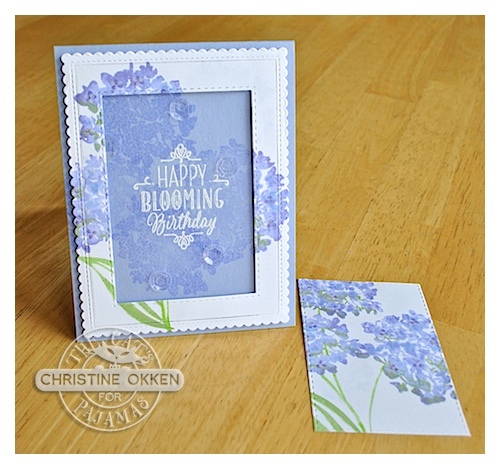 Last up for today, I have another card I created with the Big Blooms set. 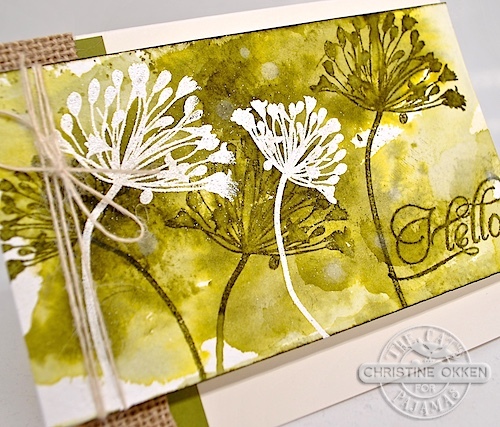 When I first saw these pretty stamps I thought of dill blooming in the garden, so I have a bit of a simple but earthy, masculine design. I began by stamping the images in white craft ink on watercolor paper, and embossed them in white. 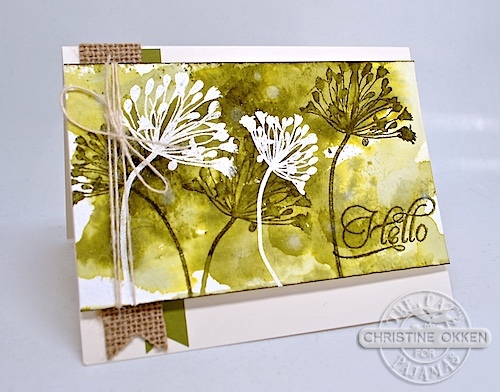 Next I stamped the green “dill” in Ranger Distress ink and then washed in some distress ink for the background, allowing some water drops to pull away some of the ink in places. Some burlap and some twine finish off the design. So, have you enjoyed this little tour of the July products at TCP? Would you like to win them? Every day Alma chooses a winner from the comments on each Sneaky Peek post for a $10 voucher to the TCP store! So, comment away :) Check here and on our Facebook page tomorrow for the winner. As well, our fearless leader and TCP Cat Packer Nancy will be up tomorrow to showcase these new goodies, and you have another chance to win! More information at the TCP Blog HERE! Gorgeous! I love they all, the Gnomies for it's whimsey and the flowers for their beauty. Amazing, Christine! I LOVE Gnomes but your floral cards are absolutely GORGEOUS!!!! Those gnomes are adorable Love the flowers too! Beautiful flower cards! The gnomes are adorable. I love those hydrangeas and the gnomes are so unique. Goodness I had to comment after seeing your gorgeous cards!! Alma's done it again - LOVE all the sets and the banner does are perfect! What a great collection of cards. 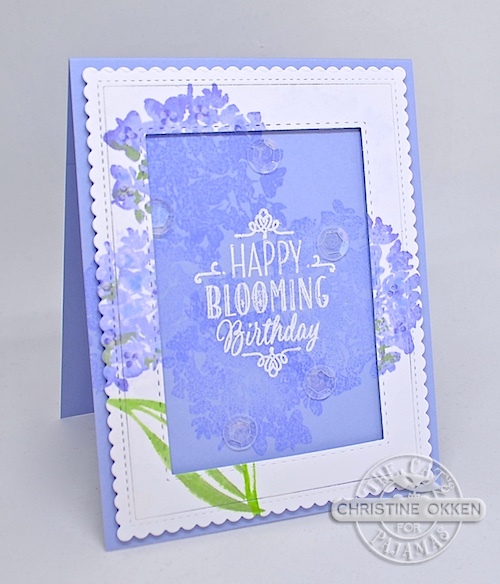 I especially like the big bloom designs--and hydrangeas are my favorite flower, too! Will definitely be trying the "two card" cut out design. I'm starting my wish list now. TFS. Love those beautiful Big Blooms. Will definitely be ordering them. wow you have bin bysy, you have made a goreous, cut and beautiful and gorgeous cards Christine. I don't know where to start. These are all just so delightfully creative and beautiful. 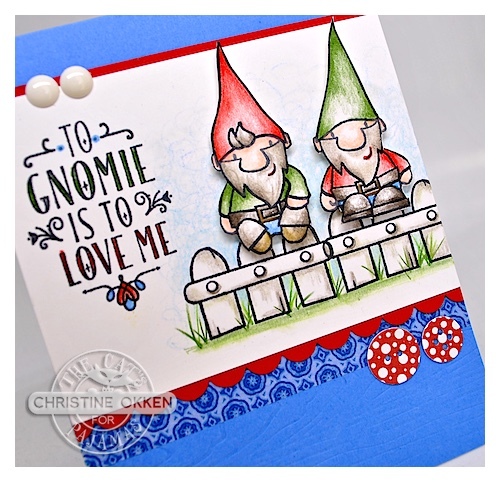 I love the first card and how you double stamped it, and such a lovely use of the panel you cut out too, the gnomes are just too cute and the masculine card is just fantastic! Always love your cards Christine. Would love to win a voucher to TCP. There designs are always so cute. Wow! Those hydrangeas are stunning! The gnomes are so cute! Love the samples, thanks for sharing. Awesome cards, Christine! Love those gorgeous Big Blooms flowers! Hydrangeas are a favorite of mine and your color choice is lovely! And the gnomes are adorable! Christine, these cards are amazing. I can't stop looking at them. Each one so unique and beautiful. 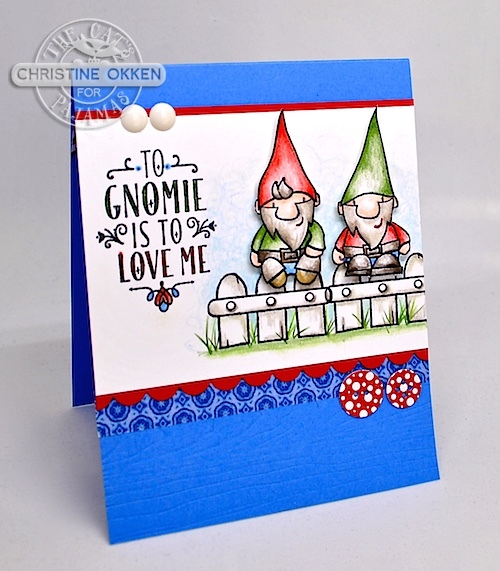 Ooh, Christine, what beautiful cards and fun ones too with the gnomes! I absolutely love the first one with the floral image and how you've used the inside for another card...that's so smart and a beautiful idea! And the gnomes are a giggle! So sweet and beautifully colored and designed. Now the third one is really cool too with the silhouette dill. It really does make a great masculine card, and I love your layout with the burlap and Distress Ink. Beautifully done, and I'm excited to see the new release! Hugs! I love the pretty flowers overflowing onto the frame! The gnomes crack me up!! Fun new goodies!! 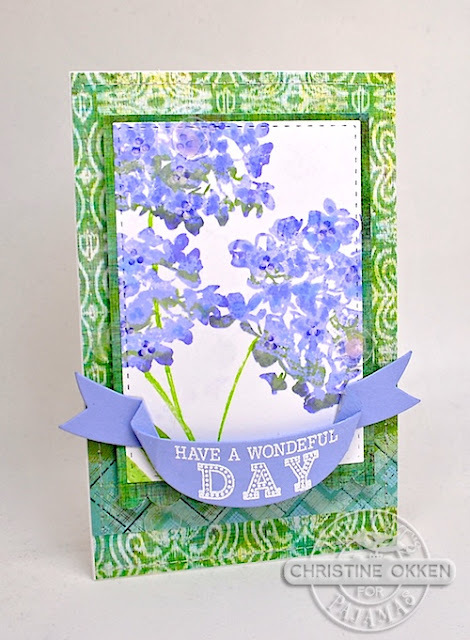 Wow, what a great way to use every part of your stamped design! I'm going to use this technique for sure. Love your cards! And all those stamps and dies!